MyVR was looking to create an explainer video that told their story in a simple and entertaining way while keeping it short and effective. The main objective and call to action of the video was to increase sign ups for a free trial. Through the use of entertaining graphic animation and a well written script, the explainer video was designed to show how effective MyVR is to vacation home rental property owners and managers. After it was launched on their home page, MyVR saw an immediate increase in trial signups and overall the explainer video has led to a 34% increase in trial signups. MyVR is a vacation rental website builder and marketing software provider. They help owners and operators of vacation rental homes to market and manage their business more easily. MyVR’s product is powerful, yet complicated. They feared rental property owners may not fully understand the huge value MyVR’s software was delivering. A marketing website could only do so much to convey that message, given that you’re often dealing with a limited attention span online. MyVR felt that video was critical to reaching their audience. Why did MyVR choose Adelie Studios? Our main objectives while writing the MyVR script, was ensuring what they did was easy to understand and the the call-to-action was clear. It was critical to keep it short, due to the short attention span online viewers have so we made sure to keep the entire video to about a minute in length. We also wanted to keep the dialogue light and friendly, as though it was a friend speaking to another friend. 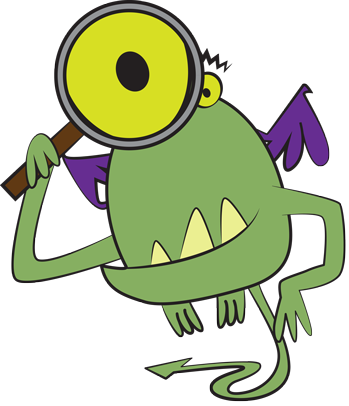 With that in mind we selected a female voice lead who could do the voice over in a very conversational and friendly tone. The next consideration we had was the design aesthetic. For this we decided to keep the drawing style very loose and sketch like. From the main characters, to the houses and background, down to the iconography; we wanted all visuals to keep that sketch and simple design aesthetic throughout. All the visuals were intentionally designed to augment the “simplicity” message we were conveying through the script. The final step was the music. For this we selected a light and bouncy track. It’s a simple track to reinforce how easy to use the MyVR dashboard is. Every aspect of the production process was designed to reinforce MyVR’s branding and the ease of their software. Upon completion of the video, MyVR placed the video on the home page of their website and shared the video on their social media pages. Adelie Studios consulted with MyVR to assist optimizing the viewers experience with the video. 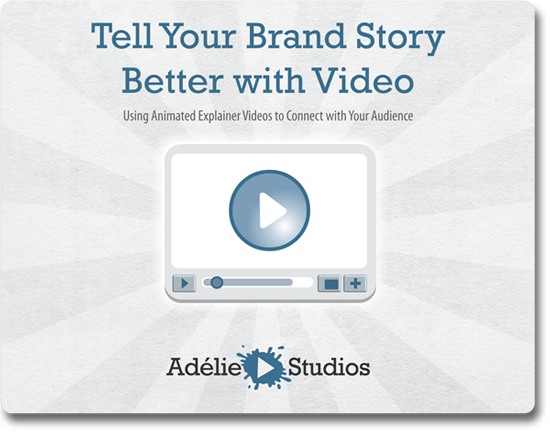 At Adelie Studios recommendation, MyVR utilized Wistia for their video hosting to ensure optimal delivery of the video, regardless of what type of device the user was viewing it on and because of the powerful analytics it provides to spot trends and see audience engagement graphs. 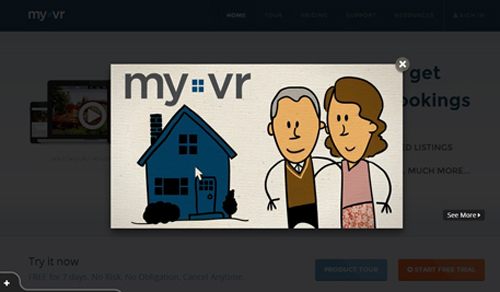 MyVR used a lightbox format to showcase their video right on the home page. A lightbox player enlarges the video making it the primary focus of the viewers attention by dimming the page. Video lightboxes have been found to increase conversions by up to 20% when compared to a traditional static video embed because the display and treatment of the video on the page is more engaging and focuses the viewers attention. See the example screen shot if the lightbox player from MyVR’s website below. The results of this video treatment were that on average, viewers of the MyVR video watched 67% of the video. Of all viewers slightly more than half watch the video to completion. The net result was that following the launch of the video, trial signups spiked dramatically and overall there has been a 34% increase in trial signups since the video was implemented on the home page. Adelie Studios did a great job of delivering a video that we are super excited about – on time, and even slightly under budget. I think the quality of the output exceeded what other more expensive firms offered. We couldn’t have been happier, and based on our bump in conversion rate on day one – our customers are happy, too.